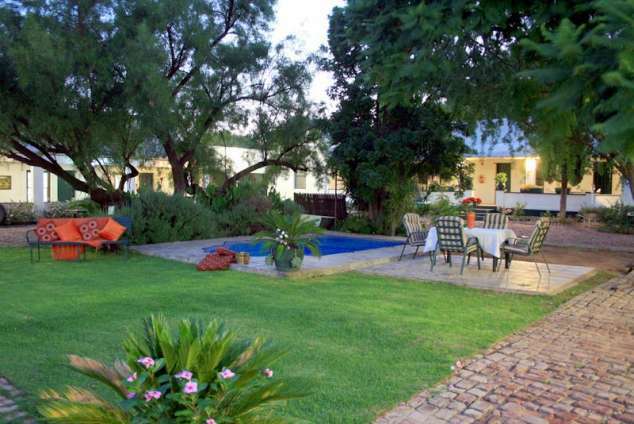 Royal Hotel, Steytlerville - Steytlerville Accommodation.
" A royal treatment in the Karoo"
The Royal Hotel dating from 1897 has a tranquil atmosphere with typical old-fashioned rooms. Watching the " activities and people" from the street facing veranda, with an ice cold drink, is a lasting experience. Steytlerville nights invites you to the brightest stars that you can imagine and you can watch that from a telescope at a neighbouring farm. Talk to your friends about the donkey car ride through town or visit one of the biggest Gregorian style Dutch Reformed churches in the Southern Hemisphere. Comprehend where the poet A.G. Visser got his inspiration from and do not miss a show over dinner at the Karroo Theatrical Hotel! Have a picnic at Draaikrans (rotated rocks) or just come and relax in the quiet Karoo. 12028 page views since 17 May, 2007.